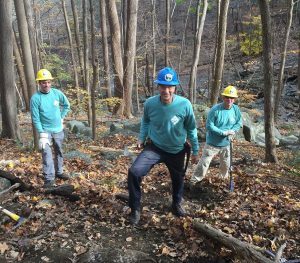 The Highlands Trail Stewards is an all-volunteer group of men and women who dedicate some of their time to develop and maintain trails along the Pennsylvania Highlands Trail Network. Most of their work is focused on the eastern end of the PHTN, primarily in Bucks and Montgomery Counties. Examples of Trail Stewards work projects include developing new trails, clearing debris from trails, improving trail drainage, blazing new trails, and installing trail signage. Interested in joining? Fill out the form below!